Blessed Miguel Pro, whose full name was Jose’ Ramon Agustin, and was born into a mining family on January 13th, 1891 in Guadalupe. He was the third of eleven children, four of whom had died as infants or young children. Since a young age, he was spiritual, and two of his sisters joined the convent. He entered the Jesuit novitiate at El Llano on August 5th, 1911 at the age of twenty. He was noted for his charity and ability to talk about spiritual subjects without being boring. He was known for his prayer life, and the long periods of time he spent in the chapel. Long time President of Mexico Porfirio Diaz was ousted in 1911 after staging a rigged re-election, and a struggle for power, the Mexican Revolution, began. 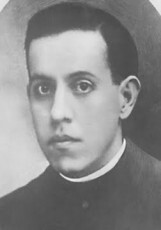 Miguel Pro studied in Mexico until 1914 when a massive wave of governmental anti-Catholicism forced the novitiate to dissolve and the Jesuits to flee to Los Gatos, California. He then went to study in Granada, Spain and then taught in Nicaragua from 1919 to 1922. For his theological studies he was sent to Enghien, Belgium where the French Jesuits, also in exile, had their faculty of Theology. His health continued to deteriorate. There he was ordained a Priest on August 31, 1925. His first assignment as a Priest was to work with the miners of Charleroi, Belgium. Despite the socialist and communist tendencies of the workers, he was able to win them over and preach the Gospel to them. Three months after his ordination, he was forced to undergo several operations because of his ulcers. Back in Mexico, a new constitution for the country had been signed. Five articles of the 1917 Constitution of Mexico were particularly aimed at suppression of the Catholic Church. Article 3 mandated secular education, prohibiting the Church from participating in primary or secondary education. Article 5 outlawed Monastic Religious Orders. Article 24 forbade public worship outside of a church, while Article 27 restricted religious organizations rights to own property. Finally Article 130 took away basic civil rights of members of the clergy, Priests and Religious were prevented from wearing their habits, were denied the right to vote, and were not permitted to comment on public affairs in the press. Most of the anti-clerical provisions of the constitution were removed, but not until 1998. In 1926, his studies in Europe were completed and Fr. Pro returned to Mexico. Plutarco Elias Calles was now President of Mexico, and unlike his predecessors, he vigorously enforced the ant-Catholic provisions of the constitution. These were called the “Calles Law” which provided specific penalties for Priests who criticized the government, five years imprisonment, or wear clerics outside their churches, 500 Pesos. By this time some states had closed all the churches and cleared the entire state of openly serving Priests, killing many of them, forcing some to marry and leaving a few to serve covertly at risk of their lives. On the return of Fr. Pro, he was asked to serve a Church which was forced to go underground. He celebrated the Eucharist clandestinely and ministered to small groups of Catholics. He left many letters detailing this underground ministry using his nickname Cocol – a name he was called as a child. In October 1926, a warrant for his arrest was issued, and he was arrested. The next day he was released from prison, but was closely watched. An assassination attempt by bombing against a government official in November 1927, provided the state with a pretext to capture Fr. Pro. A young engineer who was involved confessed his part, and said that Fr. Pro had not been involved. Fr. Pro and his two brothers Humberto and Roberto were taken to the Detective Inspector’s Office in Mexico City. On November 23, 1927, Fr. Pro was executed without a trial. President Calles gave orders to have Fr. Pro executed under the pretext of the assassination attempt, but in reality, it was defying the virtual outlawing of Catholicism. Calles had the execution meticulously photographed, and the newspapers throughout the country carried them on the front page the following day. Calles thought that the sight of the gruesome pictures would frighten the rebels who were fighting against him, but they had the opposite effect. Fr. Pro and his brothers were visited by the Generals around 11pm on November 22, 1927. The next day, as Fr. Pablo walked from his cell to the courtyard and the firing squad, he stopped to bless the soldiers, knelt and briefly prayed quietly. He declined a blindfold, and faced his executioners with a crucifix in one hand and a Rosary in the other. He held his arms out in imitation of the crucified Christ and shouted out, “May God have mercy on you! May God bless you! Lord, Thou knowest that I am innocent! With all my heart I forgive my enemies”! Before the firing squad was ordered to shoot, Fr. Pro raised his arms in imitation of Christ and shouted the defiant cry, “Long live Christ the King”! When the intial firing squad shots failed to kill him, a soldier walked up to him, and shot him point blank. President Calles is reported to have looked down upon more then 40,000 people, which lined Fr. Pro’s funeral procession and another 20,000 waited at the cemetary where he was buried without a Priest present. His father offered the final words for his burial. All of this angered the rebels, and they fought with a renewed enthusiasm, many of them carrying the newspaper photo of Fr. Pro before the firing squad. Fifty-two years after his execution, Pope John Paul II visited Mexico, keep in mind these laws were “technically” still on the books. He was welcomed by the President, and celebrated an open-air Mass before thousands of people, an act that was technically illegal, but not enforced at the time of the Pope’s visit. At Fr. Miguel Pro’s beatification on September 25, 1988, Pope John Paul II honored Fr. Pro with these words. “Neither suffering nor serious illness, neither the exhausting ministerial activity, frequently carried out in difficult and dangerous circumstances, could stifle the radiating and contagious joy which he brought to his life for Christ and which nothing could take away. Indeed, the deepest root of self-sacrificing surrender for the lowly, was his passionate love for Jesus Christ and his ardent desire to be conformed to him, even unto his death”. Relics of Blessed Miquel Pro can be found today, in the Mary Chapel of St. Raphael the Archangel Catholic Church in Raleigh, North Carolina. Fr. Miguel Pro was a young Jesuit Priest in Mexico. He lived during the Mexican Revolution, where it was illegal to say Mass, wear clerics, or promote Christ. He took his ministry “underground” to serve the sacramental needs of the mexican people, but eventually was arrested for an assassination attempt on the president, something he was innocent of. He was placed in front of a firing squad, and executed for this crime, without a trial. He did not have anything to do with it, but was martyred just the same. Pope John Paul II beatified him in 1988.